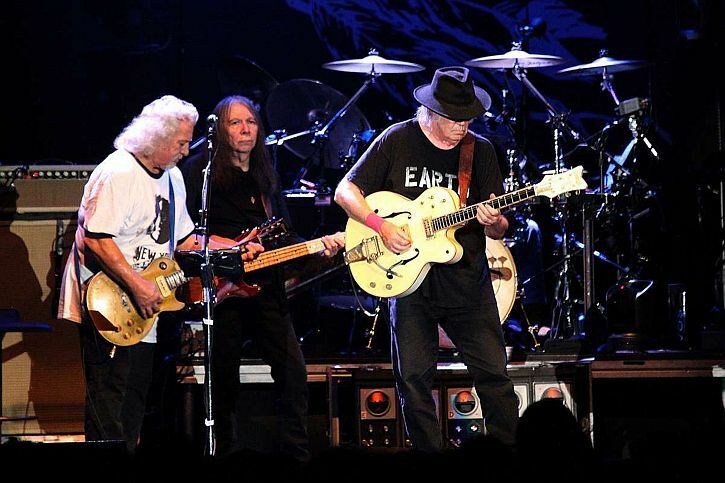 Grizzled and jowled beneath the trademark black fedora and wearing a baggy t-shirt emblazoned with ‘EARTH’, last night at Liverpool Arena Neil Young was on a mission. To save the world, no less. 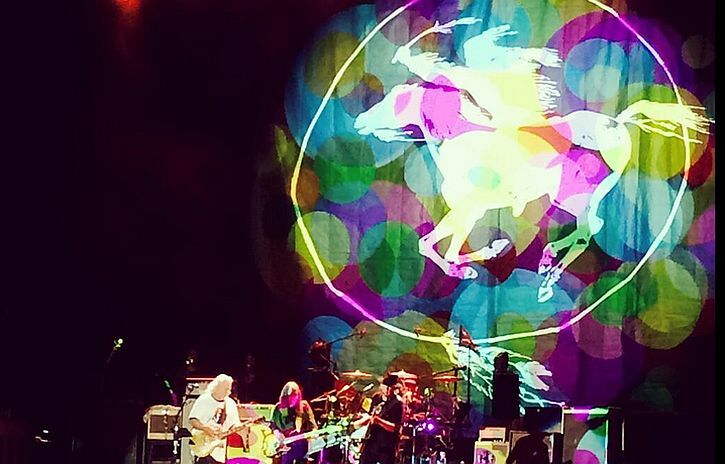 Young came on stage at around 8:45 with Crazy Horse – here comprising long-time collaborator in epic noise Frank ‘Poncho’ Sampedro (white-haired, tubby, wearing even baggier t-shirt) on guitar and keyboards and Ralph Molina on drums, with Rick Rosas on bass (standing in for Billy Talbot who recently suffered a stroke). To the rear of the stage, were Dorene Carter and YaDonna West whose backing vocals burnished the band’s fearsomely physical interpretations of numbers from the back catalogue, plus some surprises. A theme was emerging, with Neil insisting that though we may be ‘just another hundred thousand miles away/From days that used to be’, the old values of sixties protest are still valid. It’s not that simple, of course. Outside the Arena we had had to pass the flags and banners of the Friends of Palestine protest against the Israeli assault on Gaza and Neil’s planned appearance in Tel Aviv (a concert now called off due to the security situation). Young been under pressure to abandon the gig by the increasingly influential boycotts, divestment and sanctions movement. Pink Floyd guitarist Roger Waters had joined the pressure with an open letter to Young asking him to cancel the show – something which the otherwise politically-engaged, though often wayward artist had resisted. It’s a debatable issue, but I wonder whether we are approaching a tipping point where artists will consider it as morally repugnant to perform in Israel as it once was to appear in South Africa during apartheid. However. Young once said: ‘As I get older, I get smaller. I see other parts of the world I didn’t see before. Other points of view. I see outside myself more’. He has been associated with many causes, particularly environmental issues and the rights of indigenous peoples. He campaigns against fracking and has toured Canada in support of the Athabasca Chipewyan First Nation and its fight against oil companies determined to exploit the tar sands of northern Alberta. It’s all marketing. It’s all big money. This oil is all going to China. It’s not for Canada. It’s not for the United States. It’s not ours – it belongs to the oil companies, and Canada’s government is behind making this happen. It’s truly a disaster. Questions that remain unanswered. Which is why it’s important that song continues to be sung. Protect the land, free the man. Who’s gonna say that she’s had enough. The set, which lasted just over two hours, also featured more recent and some obscure material. ‘Separate Ways’ is a song from an unreleased 1970s album Homegrown, while ‘Barstool Blues’ comes from from Zuma in the same period. Every now and again, Neil would wander over to the side of the stage to whisper in the ear of a tall wooden Indian that stood there, reminding me of Hank Williams’ ‘Kaw-Liga’ who ‘just stood there and never let it show’. Then there was ‘Goin’ Home’ from 2002’s Are You Passionate? and the title track from 2012’s Psychedelic Pill. The latter was illuminated in a timely way by one of those rotating light shows that were ubiquitous in the sixties in those places where you went ‘looking for a good time’. For me, these were the least engaging moments in a great concert. There were many highlights, though. The short acoustic interval in which Neil covered Dylan’s ‘Blowin’ In The Wind’ and only had to strum the first two chords of ‘Heart Of Gold’ to be met with a roar of approval, was a high point, as was the finale – the great, ironic (and often misunderstood) anthem, ‘Rockin’ In The Free World’. 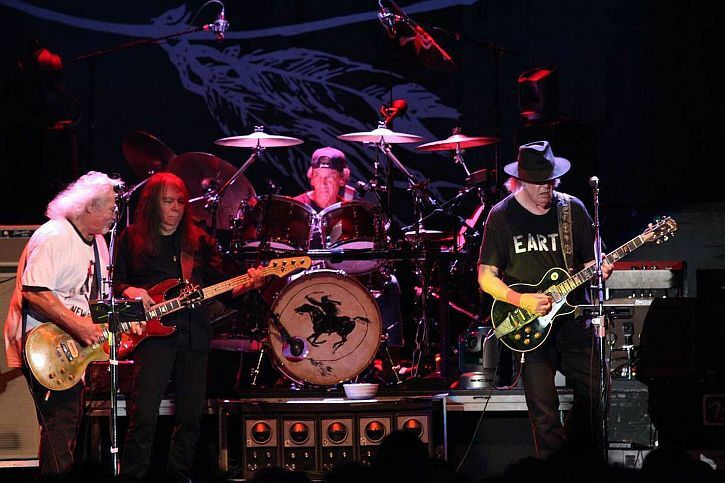 The band returned to the stage for two encores – the first of them was the new song ‘Who’s Gonna Stand Up And Save The Earth?’, an environmental battle cry that comes from the same place as ‘Mother Earth’ two decades ago. But while that took the form of a soaring hymn to gaia, this one is a pounding cry to arms, full of rage against the money men and the corporations exploiting the earth. It’s got the same elemental feel as ‘Rockin’ in the Free World’, and could be a hit single (if there is still such thing). That was followed by a spectacular rendition of ‘Hurricane’ which culminated in a ferocious storm of electric noise – splintering mountains of bass rumble and feedback. It’s nearly 40 years since I last saw Young – at Wembley in 1974. I can’t honestly recall much about that, apart from the sense of a long autumn day in bright sunshine and fragments of Joni Mitchell’s set, though I have written about it in this post. That astonishing event (The Band, Joni Mitchell with Tom Scott’s LA Express, plus four hours of Crosby, Stills, Nash and Young on one bill) came at the end of CSN&Y’s legendary 1974 tour. This week I listened to the newly-released collection of recordings from that tour (including some from the Wembley gig), curated by Graham Nash. On the whole, it’s Neil’s contributions which stand out, surviving the test of time. It’s also 40 years since the release of On the Beach, an album I’ve always appreciated, even though it was panned when it first came out, its bleakness too much of a contrast to its predecessor, Harvest. The blog Johanna’s Visions has an excellent round-up of facts and opinions on the album: July 16: 40 year anniversary for On The Beach by Neil Young. Now, nearly half a century later and a pensioner myself, I had spent an evening watching four grizzled pensioners deliver a performance of high-octane intensity. Young, the godfather of grunge, had confirmed that his star still burns brightly. With the extended solos of wailing, distorted guitar, the strong riffs and heavy drumming, Young, Sampredo and Molina demonstrated that age cannot wither them. As we streamed out onto the Liverpool waterfront a huge full moon hung in a cloudless sky: harvest moon (almost). Excellent. Young might be 110 years old but what a great singer /song writer. And what a great campaigner too. More power tio his elbow. Wonderful blog…I was there last night..much enjoyed. Thanks, Vicky. Hope I got it near enough right. I remember getting up at the crack of dawn to go down to that London gig in 1974. Possibly the first of many times we’ve since stood in the same field and never met? Or did you also see Neil at the Liverpool Empire in ’73? Playing the never then heard ‘Tonight’s the night’ album. He was whispering in the ear of his wooden friend that night too! In a way, every day, we stand in the same field and never meet, Ronnie; that seems one of the oddities of this ‘ere blogging. Strange thing about Wembley ’74 is that I went with someone, and I have no idea who it was (and no drugs can be held to account). I think that Empire appearance on the Tonight’s the Night tour was the last time Neil had played Liverpool? You have written so eloquently, knowledgeably and enthusiastically about Neil Young’s Liverpool gig. Elizabeth pointed me your way. I was at the concert myself but it’s helpful to get another perspective on it. Hell, I wouldn’t have missed the World Cup Final for just anybody and I was not disappointed. 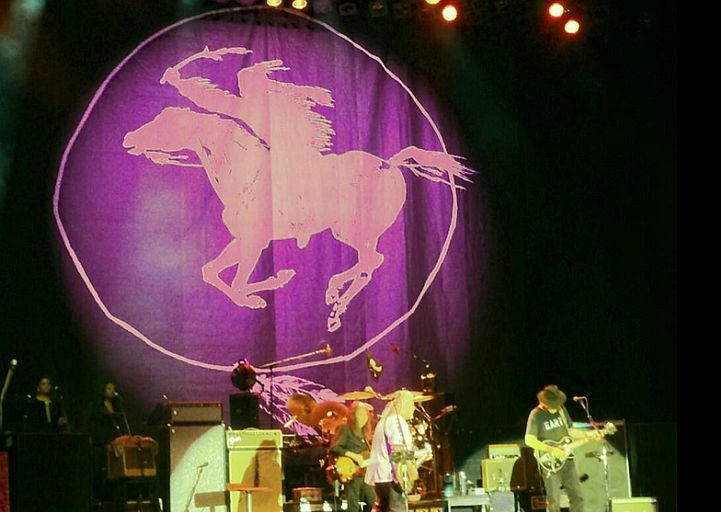 The way Neil Young plays electric is with such naturalness – as if it is a speaking voice coming from within. Just about everybody in the arena was singing along to “Heart of Gold”. Marvellous. Thanks, Neil, as a fellow-blogger you surely know how pleasing it is to get these kind of comments. After nearly 50 years of listening to Neil Young I should be knowledgeable (though hopefully not too much of a nerd). You’re the second blogger ‘standing in the same field yet never meeting’ (see below). Tell Elizabeth I know she’s out there (I see her likes) but miss her comments and her old blog. How many times it happens – the really great artists defy the set boundaries and forge ahead; the rest catch up later, having understood in the meantime. Another example pertaining to Neil: it’s also 40 years since ‘On the Beach’ was released – another album misunderstood at the time, as William Ruhlmann notes in his Allmusic review: http://www.allmusic.com/album/on-the-beach-mw0000049072. Thanks for reading and replying, Chris. Your writing, almost always compelling, really shines for me–I’m talking fireworks–when your topic is music. You transport and inform with your words and images and music clips. Hope you’ve got lots of concerts lined up to attend! Thanks, Gerry. Thank you so much those kind words, Pat. I find music is sometimes the hardest thing to write about, so your comments are very welcome. Yes – there are concerts booked into the autumn. Next up – Steve Earle in August. That just sent me straight over to Steve Earle’s tour schedule. Nothing less than 350 miles from where I am here in Vermont, so I’m hoping for some vicarious pleasure after you attend that one! It’s a rare (at least for UK) solo gig in a new ‘intimate’ venue, so looking forward to it – and will duly report.